Throughout the Bible, God relates to his people through covenants. In fact, covenant is one of the most important themes in all the Bible. This latest book in the Short Studies in Biblical Theology series shows how the kingdom of God has advanced through the progression of distinct covenants throughout the story of the Bible, collectively serving as the foundation for God's promise to bring redemption to his people. Readers not only will better understand the unity of the biblical narrative but also will see the mercy of God in his covenant-keeping promises. About "Covenant and God's Purpose For the World (Short Studies In Biblical Theology Series)"
Thomas R. Schreiner is the James Buchanan Harrison Professor of New Testament Interpretation and Professor of Biblical Theology at the Southern Baptist Theological Seminary, Louisville, KY. He serves as Associated Dean of the School of Theology. Dr. Schreiner joined the Southern faculty in 1997 after serving 11 years on the faculty at Bethel Theological Seminary. He also taught New Testament at Azusa Pacific University. Dr. Schreiner, a Pauline scholar, is the author or editor of several books including, Romans, in the Baker Exegetical Commentary Serieson the New Testament; Interpreting the Pauline Epistles; The Law and Its Fulfillment: A Pauline Theology of Law; The Race Set Before Us: A Biblical Theology of Perseverance and Assurance; Still Sovereign: Contemporary Perspectives of Election, Foreknowledge, and Grace, co-edited with Bruce A. Ware; Women in the Church: A Fresh Analysis of I Timothy 2:9-15; Paul, Apostle of God's Glory in Christ: A Pauline Theology, 1 and 2 Peter, Jude. Dr. Schreiner was educated at Western Oregon University (B.S.) Western Conservative Baptist Seminary (M.Div. ; Th.M. ), and Fuller Theological Seminary (Ph.D.). 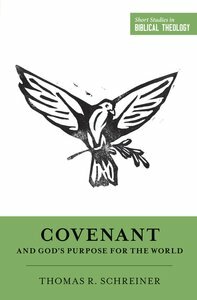 Customer Reviews For "Covenant and God's Purpose For the World (Short Studies In Biblical Theology Series)"
This short book is extremely helpful in unpacking the covenants throughout the Bible. Schreiner explains it simply, and gives the reader a firm foundation in understanding the overall structure and story of the Bible. Highly recommended for pastors and lay Christians. This is a good short book (119 pages) to read in order to get better acquainted with Covenant Theology. It is not exhaustive but a primer. Schreiner is a Reformed Baptist and so we see Covenant Theology explained through the Baptist framework.